You may worry about protein if your toddler won’t eat meat or fish. Protein is actually not the main concern for your meat refusing kids. Read to learn how much protein they need, what other nutrients they may be missing out on, and see a list of healthy recipes to serve little ones who don’t like meat. Some of these recipes are GREAT for baby, too. Toddlers can be a special kind of beast when it comes to eating anything besides carbs. Moms are always wondering if their little one gets enough protein in between all the fruit, cereal, bread, and pasta that they will inhale. The carbs are definitely not bad! But it leaves you wondering whether they are getting the right nutrients. This concern is bigger for parents of what I call the “Accidental Vegetarian.” My 3 year old happens to be one of these! The Accidental Vegetarian is a toddler who might eat meat or fish here or there, like a hot dog or chicken nugget dinner every once in awhile, but otherwise shies away from eating meat. Now, there’s no need to go around calling them that — who knows what their little brains will think when they hear a big word like “vegetarian.” My son thought we were taking a trip to the potty when I told him we were going to the diner the other day. “Mama, I DON’T have diarrhea!” Diner…diarrhea…kinda close, ha! But if that description sounds like your kid, I have some ideas for you. While protein can be a concern, they are still LIKELY to meet their protein needs even without eating meat regularly. For toddlers, divide their body weight by two. The number that you get is the number of grams of protein they need per day. This is obviously an estimate, but it’s enough to give you a good idea of what they need. So if they are 30 pounds, they need about 15 grams of protein per day. One cup of milk has 8 grams of protein. So if they have two cups of milk per day, they meet their protein needs easily. Most parents feel pretty relieved when they hear that! But you might say, well my kid doesn’t drink milk, or they only drink 1 cup per day. That’s totally fine. I just like to use milk as an example to show you how easily toddlers can get their protein even without meat. There’s no need to resort to protein bars or protein powders all day long. So, your toddler probably gets enough protein in their diet. But what else are they missing out on if they won’t eat meat, or just don’t eat it very often? It’s a four letter word, it begins with I….yup, you guessed it. (No, it’s not Ikea.) IRON. Iron is essential for growth and development — something your little ones are doing an awful lot of! It is worth paying a little extra attention to. This is especially important for babies & toddlers who were born pre-term or had a low birth weight, because they may have less iron stored up in their body than full-term babies. Now, don’t feel like you need to run out and buy an iron supplement. Most of the time, they can get what they need from food alone. Meat, fish, and poultry are the best sources of iron, but there are plenty of vegetarian sources, as well. However, our bodies do not use vegetarian iron sources as efficiently, so your little one will need higher amounts if they don’t eat much meat. Take a look at this list of high iron foods and see if there are any that your toddler eats regularly. Don’t forget, cooking with a cast iron skillet provides some iron, too. When I look at that list, I only see five foods that my toddler will eat willingly, so I assume you might be thinking the same thing. I always encourage you to continue serving foods even if they don’t eat them. And though that helps work on picky eating, it doesn’t solve the problem of them getting enough iron. One of my favorite ways to boost toddlers’ nutrition is with smoothies. I haven’t met many kids who turn down a smoothie, and you’d be surprise what you can get in there. I have a great chocolate smoothie recipe with black beans (I’ll have to get it up on the blog), and spinach is easy to blend up in smoothies too. Here are a few toddler-friendly iron-rich recipes to try from some of my RD friends. BONUS- many of these are baby-led weaning friendly, too. Breastfed babies need iron in their diet starting around 6 months, so be sure to include high-iron foods in baby’s meals, too. 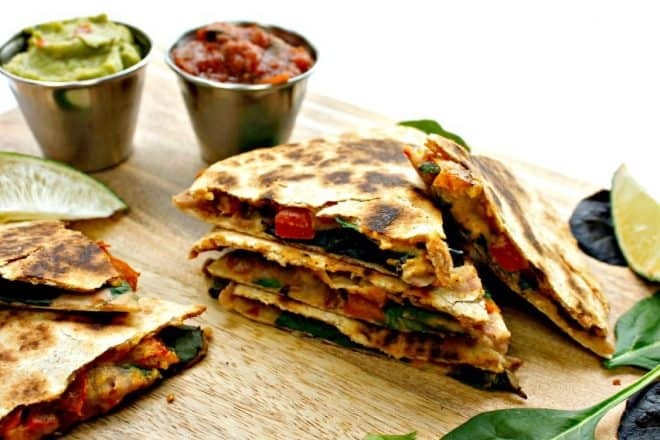 Loaded Fajita Quesadillas from Wholly Plants – the iron comes from the refried beans, so you could even try a quesadilla with just cheese and refried beans, if you think your little one won’t eat this veggie-packed version. Tomato White Bean Naan Pizza from Amy Gorin – Even if your toddler is not big on fresh tomatoes, they can pick those off and still get an iron boost from the white beans. And- no need to make your own pizza dough! Black Bean Veggie Burgers from (me) Mama Knows Nutrition – surprisingly enough, everyone in my family enjoys these veggie burgers. Butter Bean Blondies from Snacking in Sneakers – I haven’t tried this recipe yet (I’m going to!) but I’ve tried blondies with chickpeas, and you really don’t taste them! Vegan Lentil Nuggets from Sarah Remmer – finger food at its finest, in nugget form! “When I look at that list, I only see five foods that my toddler will eat willingly, so I assume you might be thinking the same thing.” – LOL, yep! So glad you enjoyed the post. I hope it was helpful! Ha, my toddler has definitely entered a picky stage lately. Glad to have this list for some new ideas!! It’s a challenging phase for sure! Moms already work so hard, and picky eating just throws another curveball! I feel like you wrote this post for me! Hooray! Thank you so much!!! Yesss it was inspired by our convo! !